This item is a universal remote, which can turn all IR remote controllers into one with Tuya Smart/SmartLife APP on your smartphone or tablet to integrate control of home entertainment and home automation devices. 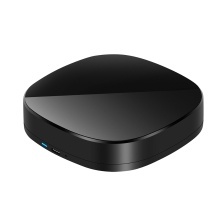 It allows users to remote turn on/off connected appliance of different types and brands via app SmartLife/Tuya from anywhere. It also can achieve voice control by smart speaker boxes and it can provide you with amazing smart home control experience. You can customize for your family and enjoy the peace-of-mind. 【APP Control】Control IR appliances with Tuya Smart or Smart Life App anywhere anytime. Turning your basic home devices into smart devices and making life smarter and more convenient. 【Compatibility】Supports almost all IR controlled devices and supports 38KHz frequency signal learning, including your air conditioner, TV, TV Box, DVD, IR electric curtain and more. With large IR data base. 【Voice Control】Compatible with Alexa/Echo, Google Home, IFTTT to voice control your TV, STB, Air Conditioner and Fans. The device only supports 2.4G WiFi. 【All in One】Turn all IR remote controllers into one APP on smartphone/tablet. You will never be bothered by a missing remote controller, say goodbye to chaos, and maintain an carefree life! 【Super Size&Timing】Super mini body, and it occupies little space. With timing function: You can set timers to turn on/off your IR electronics. Keep peace of mind. Control mode: Mobile APP "Tuya/SmartLife"